This is Platform 2 of Elverson Road DLR station on Sunday 20th December, as you can see the whole platform is covered by a thin yet very hard, very even and very slippery layer of ice and this is of course extremely dangerous. I took this photo at 12:19 pm and this means that this ice was there for the whole morning. I appreciate that on Sundays from Elverson Road there are fewer passengers than on weekdays, but surely those few still deserve enough customer care to prevent them from slipping all the way under a passing train. 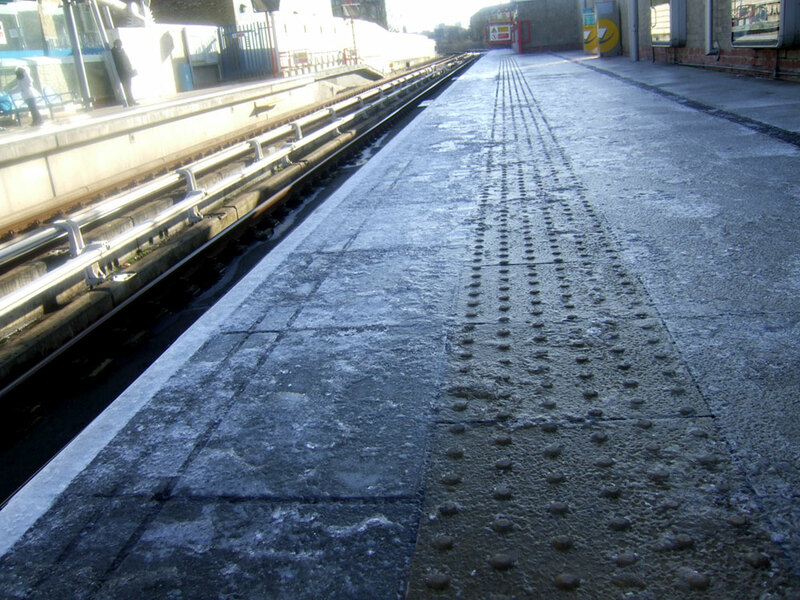 I would have thought that the DLR had been running for enough years to let somebody figure out that on Platform 2 of Elverson Road the sun doesn’t shine and the ice doesn’t melt and on days like these a bit of gritting salt must be spread on the platform. I emailed this photo to the DLR customer services and I really hope that they’ll sort this out before their insurer finds out, or even worse. The DLR is largely a commuters’ train, but this is no reason to neglect safety on Sundays.